We’re going to show you a clear path to becoming a high performing 200-hour yoga teacher. A program where you’ll walk away with a skill set, not just knowledge. When you train like an athlete, doing comes first, followed by knowing later. If learning more about a yoga teacher training program that doesn’t require you to leave your job and family for weeks on end, one that gets you yoga side-hustle ready is something that piques your interest and excites you, then keep reading to get all the details about how it works, why it’s different, and how you can get started. You don’t have time away from your home, family, and other responsibilities. You can choose the program that best fits your needs, philosophy and learning style, no matter where you live. You have the flexibility to schedule study time throughout the day - when it’s convenient for you. You don’t have to spend extra money on travel or housing. You’ll receive individual, personalized feedback on every activity from your personal coach. You’ll video your practice and teaching and submit them for review, no book reports here. Watching yourself on video is a valuable way to discover things about your practice and teaching that you’d otherwise miss. You’ll expand your ability to self-reflect and self-correct. You’ll practice teaching skills in real time (via live Zoom calls) and give and receive feedback while building community. You’ll put your entrepreneurial skills to the test as you promote and launch your yoga class on fb live. Are you ready to create your own thriving yoga side hustle? Your goal is to teach yoga and to turn that teaching into a thriving side hustle. You are looking for a program that is athletic and fitness based. No Sanskrit. No OMs. No apologies. You understand that it takes work. You’re looking for skills mastery, not a tropical vacation. 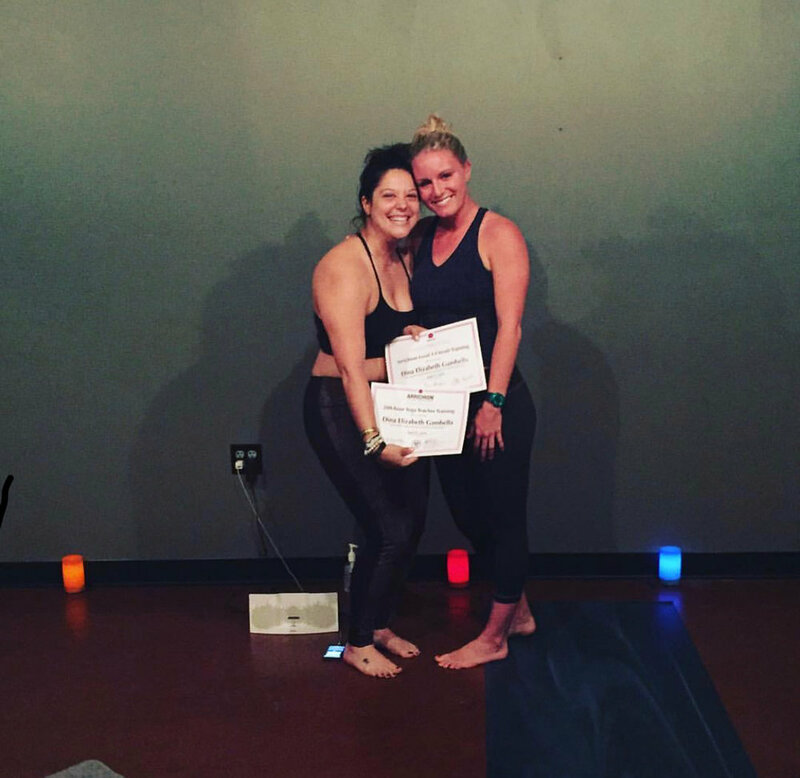 Natalie applied her YTT training and opened her own yoga business. My name is Dina Gambella and I am a registered yoga teacher. I do couples counseling, I do addiction counseling, I do family counseling, and adolescent counseling as my full time job, and I have always wanted to bridge that and yoga. Arrichion gave me the confidence to build up my yoga teaching skill to where I could supplement and add that to my therapeutic knowledge. I felt very prepared to go out and teach as soon as we finished training. At the first information session, I can remember Quinn saying, “This is not really a zen yogi-yogi, but you will be able to teach a script, write a script, and feel confident about it” and she was absolutely 100% correct. The Arrichion Hot Yoga training program is a well-rounded curriculum that provided me with a very strong foundation for beginning my journey as a yoga teacher. The program is structured in a way that enables the students to obtain a comfortable grasp on the wide range of yoga topics that are essential for being a successful teacher. In addition, the training instructors are very encouraging and open about the fact that obtaining the RYT 200 certification is only the first step of the journey and that there is a great deal more that we will and should learn in the future. Finishing the program, I am inspired to continue becoming more knowledgeable about yoga as I develop my own personal practice and share it with others as a teacher. Questions about Teacher Training? Send us a message!